Now its proximity to the Mexican border only gives it a comparative advantage in crime and exploitation. All the decent folk have long since left, but the stranger who rides into town is no choirboy. 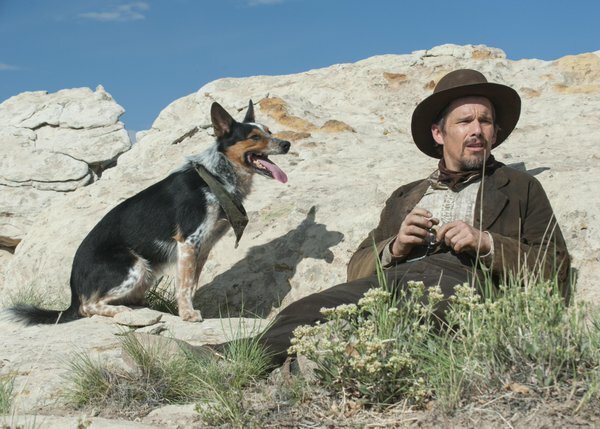 He is not looking for trouble, but it finds him nonetheless in Ti West’s In the Valley of Violence (trailer here), which opens this Friday in New York. His name is Paul, but he is the sort of gunslinger who often has no name. The Mexico-bound former cavalry man has deserted due to his mounting revulsion for the so-called “Indian campaigns.” We can tell by looking at him he was disgusted by the killing, precisely because he was so darned good at it. However, Gilly, the ringleader of the local Denton ne’er-do-wells is not so fast on the uptake. As the town Marshal’s deadbeat son, he can usually get away with his bullying behavior, but Paul is an entirely different sort of cat, just like his assertive dog Jumpy. Like night follows day, Gilly challenges Paul when he reluctantly stops for supplies. Paul might have let things slide had the entitled thug not threatened his dog. When Paul duly shows him up, the chagrined marshal rather apologetically runs him out of town, to preserve public order. At that point, the deserter and the lawman would be fine letting matters stand, but not Gilly. Of course, he and his entourage lay a trap for Paul, but they only succeed in killing Jumpy. We know what that means—and so does West, who delivers Charles Bronson levels of vicarious payback. Who knew Ethan Hawke had so much Eastwood in him? Granted, it is more of the tortured Josey Wales Eastwood, but it definitely still counts. He instantly projects a sense of a man well acquainted with death, while delivering West’s frequently droll dialogue with wry understatement. He also forges some terrific (albeit slightly problematic) ambiguous romantic chemistry with Taissa Farmiga, as Mary Anne the younger and more naïve of the two sisters operating the town’s high vacancy hotel. Yet, the real scene stealer is none other than John Travolta, who gleefully gnaws the scenery even as his character struggles to be the voice of reason. Travolta been grinding out a spate of VOD-theatrical day-and-date B-movies, but Valley gives us reason to hope he might just have yet another comeback in him. As an extra added bonus for cult movie fans, West’s frequent co-conspirator Larry Fessenden does his thing playing one of Gilly’s ill-fated cronies. Although The Sacrament was billed as a departure for West, the Jonestown-inspired found footage thriller was not really so far removed from the horror field. Granted, there is a spot of blood here and there in Valley, but it is a western through and through. Clearly, West has some affection for this genre too, at least as it was realized in Italian productions. He stages some nifty gun fights and pens some razor-sharp, attitude-drenched dialogue. It is a retro blast with uber-modern sensibility. Very highly recommended for a wide spectrum of genre fans, In a Valley of Violence opens this Friday (10/21) in New York, at the Village East.